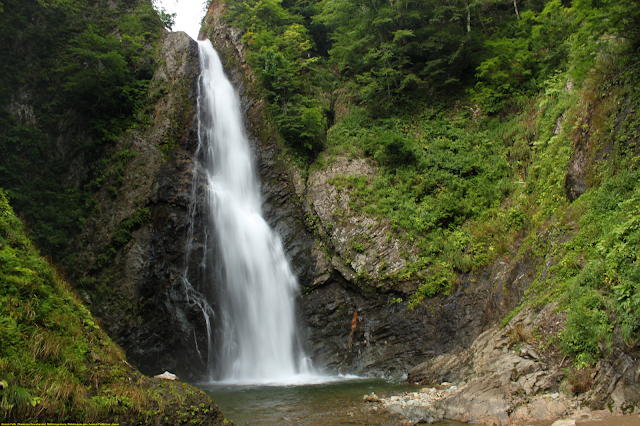 Anmon Falls is one of the must-see spots in Shirakami-Sanchi, a UNESCO World Heritage Site. It is a collective name for three waterfalls upstream of Meya Valley. The first fall drops 42 m, the second drops 37 m, and the third drops 26 m. The trekking route along the valley allows you to see all three falls and enjoy a superb view in two hours. The area is surrounded with steep rock walls and old beech and pine trees. Although the place was covered with a thick forest that was difficult to even walk through, now a motorway cuts through it. You can go up the river using this road to see the three falls, from the third to the first. From the bus stop, the trailhead is a bit tricky to find. Walk out to the main road and turn left, crossing the metal bridge that spans the river. Just after crossing, you’ll see signs pointing the way to (Anmon no taki hodou) Turn right and follow the asphalt past a toilet and a concrete dam to the start of the trail. There’s a water source here, so fill up your water for the walk. You’ll see a trail leading into the forest directly to the left of the water source. Ignore this trail, as you’ll use it to complete your hike. Follow the concrete trail along the river instead, which will lead directly to the waterfalls.